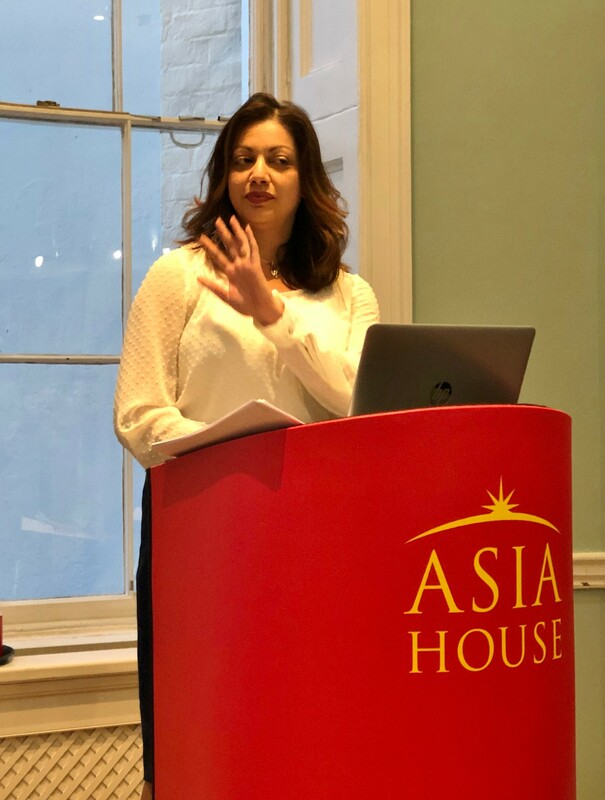 Dr Mehreen Chida-Razvi, a SOAS research associate and specialist on the art and architecture of Mughal South Asia, gave a very interesting presentation at Asia House in London earlier this week. 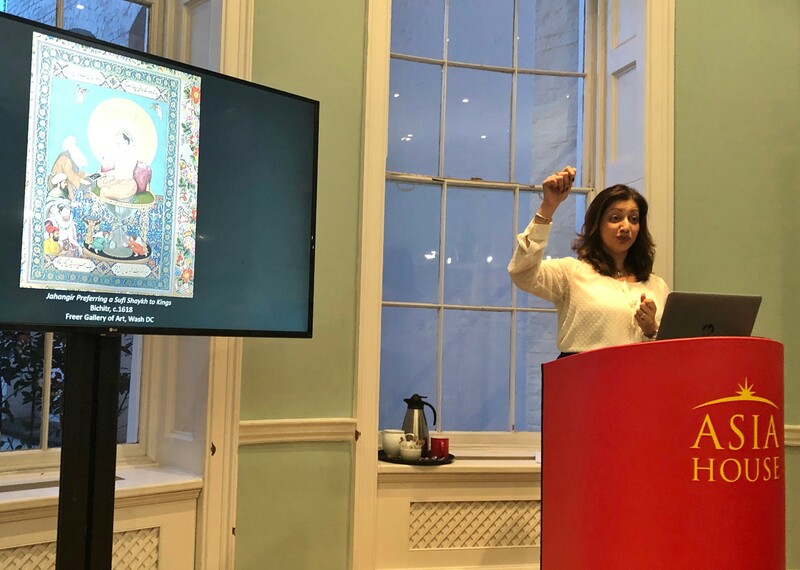 She spoke on the influence of Christian art on depictions of power in Mughal miniature painting art in the Court of the Mughal emperor Jahangir (b. 1569- 1627). 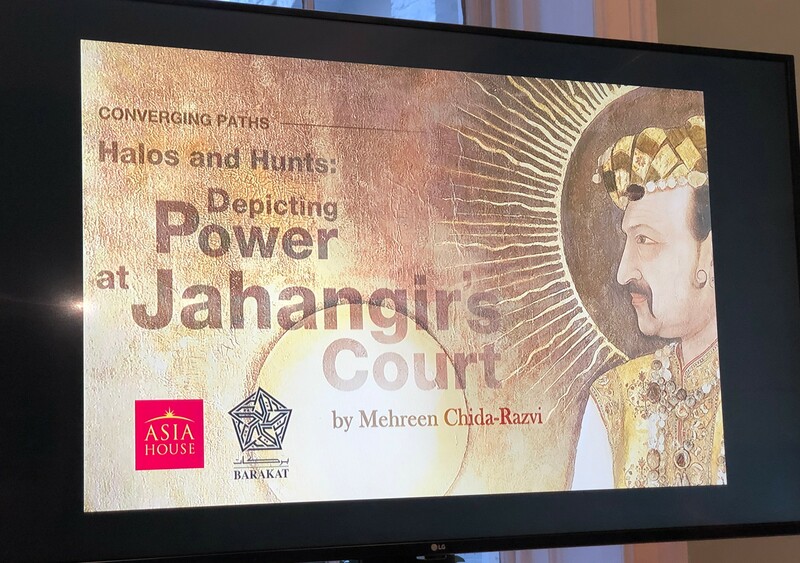 She demonstrated how visits to the Court by Jesuit priests in the early 17th century greatly influenced the Court and its art. The Jesuits presented the Emperor with numerous Bibles and other works, many of which contained engravings that showed typical Christian imagery. Jesus was shown being crowned by angels for example, the Madonna was depicted traditionally in a very central role, and members of the Holy Family and saints were shown with halos. 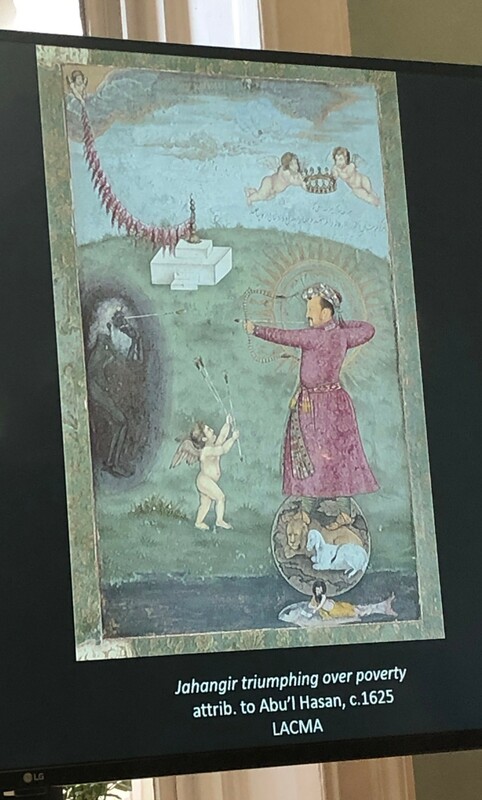 In an interesting example of 17th century cultural appropriation, all these elements came to be used in Mughal miniatures to illustrate Jahangir and his ancestors to demonstrate their legitimacy as rulers and their power. The emperor was shown being crowned by angels; with a large, radiating halo; and Mary was adopted as a Mughal-Islamic figure. 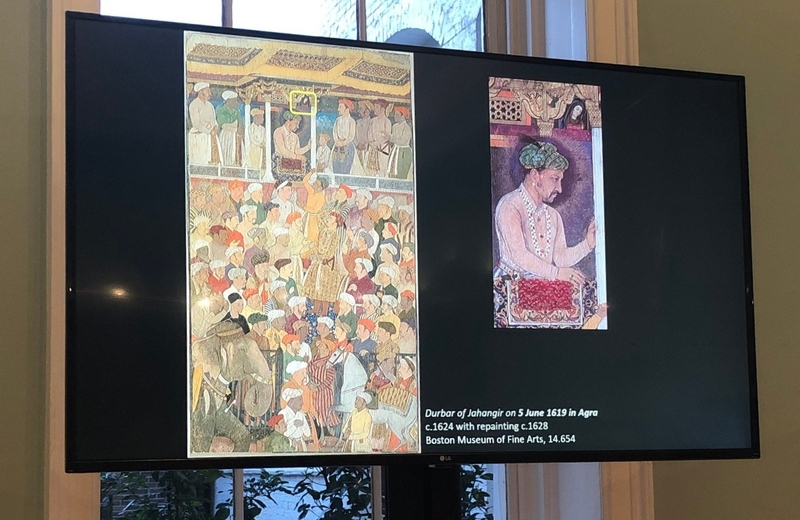 Dr Chida-Razvi showed several Mughal court scenes in which small images of Mary can be seen peering down on Court affairs. 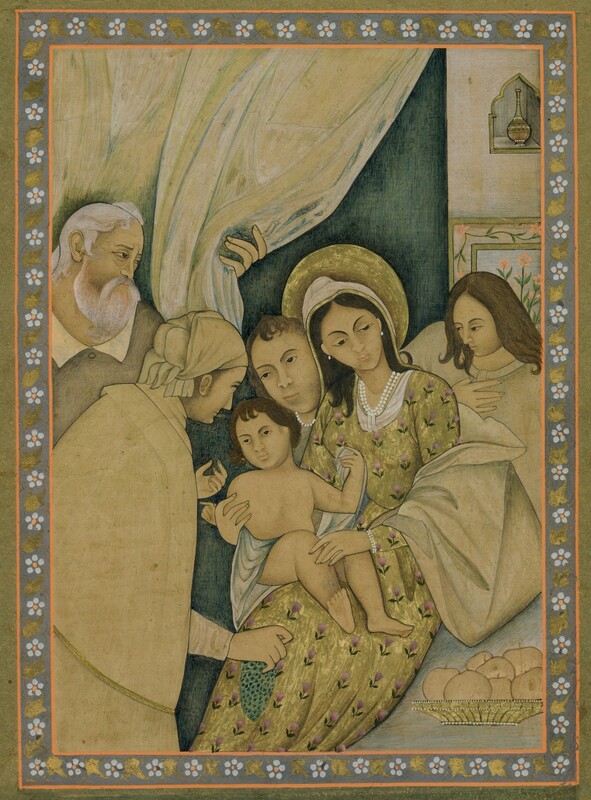 Christian imagery also was adopted by the Qajar rulers in Persia, across all sorts of media, from paintings to carvings to metalwork. 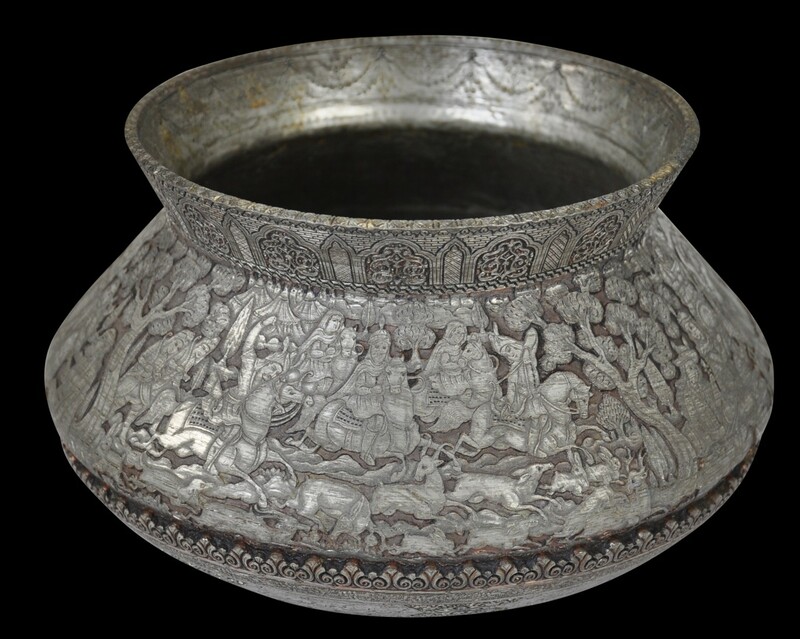 Photographs here show the evening at Asia House; a tinned copper bowl is an example of 19th century Persian art that we currently have in our gallery and which includes Christian-style imagery; and an Indian miniature of the Holy family, a 19th century version of the scene, which we sold several years ago. Receive our monthly catalogues of new stock, provenanced from old UK collections & related sources.